I'm still new to alloy boats but trying to learn as much as I can. I've been hoping to could find something small to start with, and stumbled across this little boat near me here in Massachusetts. Stopped and talked to the owner today and he is not interested in selling. But, he said the boat was built by a "Big Dig welder" who made six identical boats. He doesn't know the disposition of the other five. OceanTrvlr, the skiff was built by someone who's not really familiar with welded skiff design- the reason is; this is a copy of a wood boat done in metal. 2nd, there appear to be "chine bars" and maybe a "keel bar" as well? Last the idea of the design's shape is sound - its just the wood boat structure that shows the lack of design experience in metal. Several designers, some now retired, used to sell plans for skiffs like this- sound shape, good form and nice lines - but they were selling to the home built market. Those designers, and many today, can't begin to guess at the welding or metal forming skills of their plans buyers. So, things like "chine bars"and flat bar frames ( both totally unneeded in skiffs of this size) are provided in the plans sets in order to give a large margin of error. That margin is to fill in the (potential) lack of skills among the plans buyers- not necessarily the designers. The problems with that skiff will be the sheet edges nearest the big round bars at the chine and keel- the joint structure is hard to get adequate penetration to insure there are no corrosion cells created by the joint cross section. The flat bar type transverse ribs also have a contribution to potential corrosion due to the (usually) wide material - 1/4" in many cases- creating a flat to the sheet inside and trapping water allowing corrosion lines in the hull panels. So, while nice and simple to view - there's some real life-shortening design features to that skiff; in my opinion. Not trying to be the grump about this design and don't have the detailed photos to confirm my opinions, but I do want to contribute to your knowledge of plate welded boats. Edge to Edge chines, keels, and even sheer (or gunwale) seams are better than adding wide "welding targets" to accommodate someone who hasn't developed their metal working skills to the level required. This sketch tries to introduce the issues of this type of weld joint for discussion. First to note!!! the thickness of the plates to the bar size are NOT the same as in your photographs!!! That is super important for you to understand. 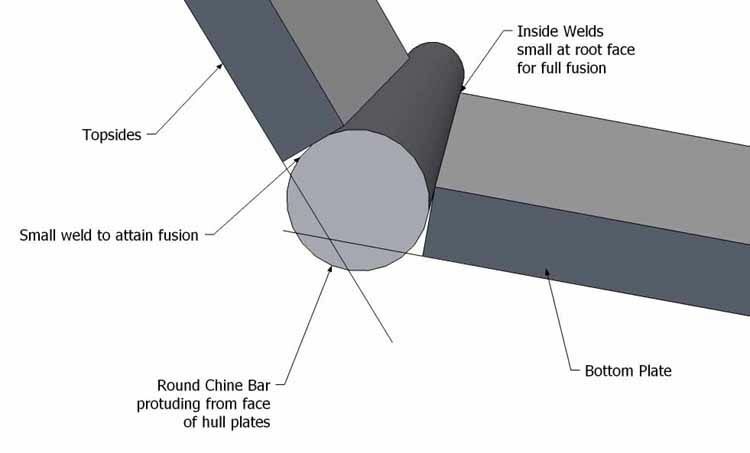 The sketch does show one method of using chine bars- the designers have mentioned online and in interviews they used these weld joints to give a big welding target for their newly minted boat builders. These joints imply four welds instead of two- top and bottom inside and out is four long welds. Sheet Edge-to-Edge is two long welds- one in- one out. This joint arrangement also has some designed-in problems! The relative sizes are changed again so the welds implied- that is to get a full 100% fusion weld of all parts- is even worse due to the lack of mechanical V or U shaped grooves for the weld root area. 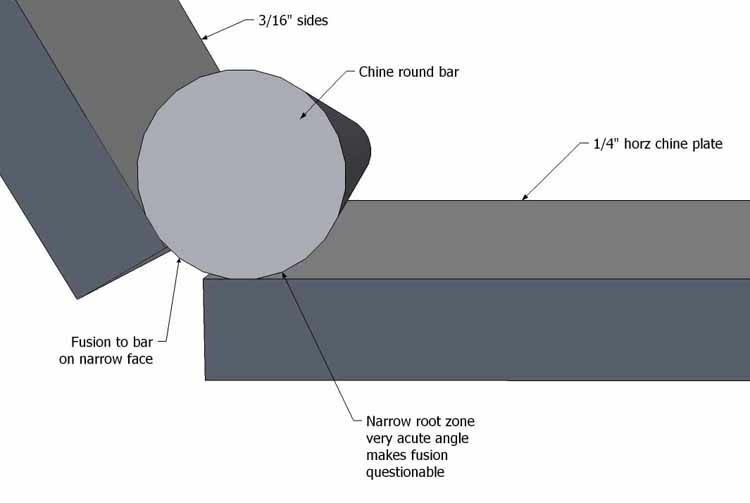 This sketch of the cross section of a possible chine bar joint shows the bar larger in scale to the joint and more 'backing up' the weld. In this the outer weld could be (not always would be) a single huge, hot, high powered, hogg of a weld picking up the two sides of the sheets as well as the backing bar's surface. But this does leave some tight geometry for the two inner welds as I've remarked above. I hope this discussion is not confused with shape, lines, or form of the skiff shown? 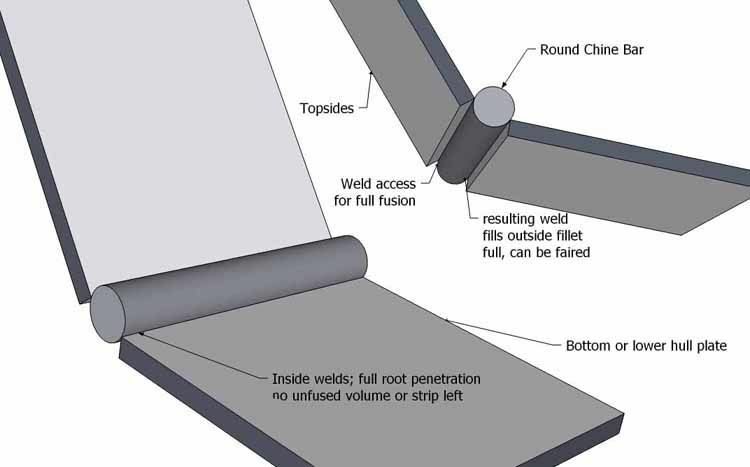 I'm remarking about the chine (and maybe the keel ) joints and what is potentially a problem getting high quality welds and longer term corrosion resistance from the design. None of the major names in welded boats use the joints I've shown above- they're only used in designs that are sold to home builders due to the designers' fears of home builders' welding skills- well fitting, layout, and welding skills ! https://metalboatkits.com/product/16-foot-skiff/ this link to a kit provider of a design of a similar skiff- shows the framing needs for this size range of boat. Notice the clean, spare and minimal structural elements required in a skiff of this general class? The framed, chine bar skiff's shape is very similar to the link but not nearly so "wooden" in design. OceanT, I hope you're adding to your knowledge-base about welded boats, and that you won't misunderstand the post: I don't have confirmation of my fears about the skiffs shown! I have built a few skiffs and repaired some too.... so my sketches are provided to help you understand the remarks I've made. The joint shown in your photos and my sketches are problematic in my view- so I wanted you to have my reasoning - hence my usual "War and Peace" length reply.